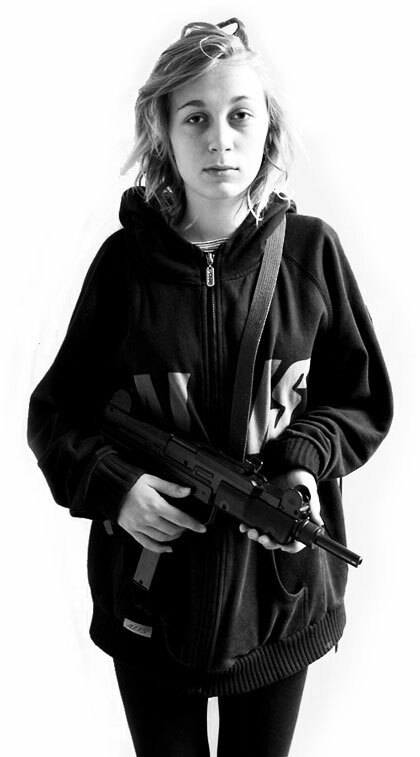 The Langeland School Massacre Project is an art work consisting of a series of 100 photographs. Four school classes of 14 year old students, participated in this art performance staging a nightmare school shooting incident. There is I think, within all of us, a latent sense of raw violence that can be triggered in extreme situations. Brutality is there, no one is safe and no one is pure. Look at the media and you will see frequent cases where people are cited as defending their families, their homes or even intervening with things like street fights, and you quickly become aware of one linking theme – They’re normal everyday people, and they never thought they were capable of such actions. With this Project, I wanted to share my feelings towards this emotional state that people can reach, staging a situation where this kind of violence has been triggered. No matter how you look at it, the media is fixated with the innate violence in society, hyping and scandalizing, blowing things out of proportion to create hysteria, and a large percentage of the material they cover focuses on the instinctive violent behavior of adolescents. What if I gave a group of children the opportunity to create a mirrored incident of how they are perceived in the media? I asked how they would produce images that would correspond with the kind of media coverage that saturates print and airwaves after such a tragedy. Remember, we’re talking about children raised in the safe confines of a Scandanavian democratic society, but there was a sense of understanding and scale to the violence that soon became apparent. The day produced a series of 100 images, all staged, dramatized, photographed and edited by children as part of the performance. This is a case study of how teenagers perceive a massacre within their own particular. Don’t dismiss this as kids going wild with prop machine guns and theatrical blood. It was not about fun, to their minds this was a serious project. To myself, and their distraught and in some cases tearful teachers, the real shock as the day unfolded was to take in the perfectionism, conviction and skill that they imbued the work with, without any prior visual foreknowledge of the reality of such events. Somehow, they managed to express their inner visualization of what images of death can be like. How could they produce such detail so young?